ChiIL Mama is thrilled to announce another Short Shakespeare production is opening this weekend at Chicago Shakespeare Theatre down at Navy Pier. We've been ardent admirers of this series for years. These shows are a bit shorter in length than standard Shakespearian fare (75 minutes/no intermission/15 min post show discussion) but they are big on quality, authenticity and professionalism. In fact, here's our rave review on Macbeth, the first Short Shakespeare show we ever saw there, back in 2011. The Short Shakespeare shows are no Cliff Notes! These shows are NOT dumbed down for kids in any way. In fact, the language is original, they just cut some of the long winded bits to shorten the journey between the key plot points. This makes for an action packed, authentic experience that captivates school groups and Shakespeare wary adults as well. It's brilliant really. These shows are a stellar way to introduce the bard, and possibly spark a life time interest in classic theatre, the flow of language and the thrill of all the elements in live theatre playing out together on stage. Even the play bills are fun as well as informative, with kid friendly info, games, and a cool layout. ChiIL Mama and Sage will be there for the opening this Saturday morning, so check back with us shortly for our full reviews. 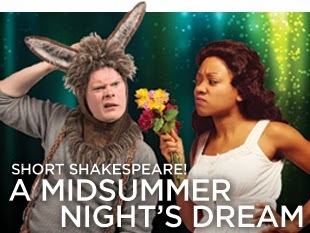 A magical forest filled with a host of some of Shakespeare’s most comedic characters make A Midsummer Night’s Dream one of his most popular plays. CST’s 75-minute abridged Short Shakespeare! production serves as an ideal introduction to the Bard—for audiences of all ages. When lovers cross with mischievous sprites in an enchanted forest, a series of mishaps occur and nothing is what it seems. Add to the mix a bevy of fumbling actors and chaos breaks loose until dawn breaks and all is once again right with the world. After the performance, the actors remain on stage for a brief question-and-answer session. Then join the audience in the Lobby for one-on-one conversations and photo opportunities. A CST Family production most enjoyed by ages 10 and up. Read a short summary of this 75-minute trip into a magical forest filled with a host of some of Shakespeare’s most comedic characters. Have the actors in A MIDSUMMER NIGHT'S DREAM acted foolishly in the name of love? See their responses. Short Shakespeare! A Midsummer Nights Dream is presented in the Jentes Family Auditorium.